We only had to walk a couple of blocks in the rain and reached the Bryggens Museum at 4:00. The museum is here because after a very bad fire in 1955 they began excavations here and discovered the largest archeological excavations in northern Europe. 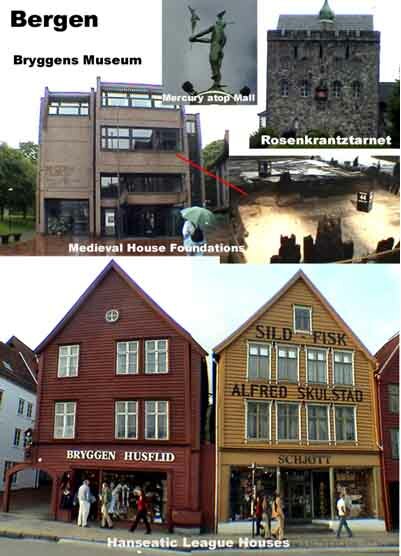 You can see the foundations of medieval houses and many artifacts of ordinary life in those days including runic inscriptions from the 14th Century. They had a computer there that translated your name into runic script. It was amazing the wealth of things they found in these diggings. The museum was very well laid out and almost as nice as the Roman museum in Merida in Spain. We got out of there at 5:00 because they were closing and walked over to the open market place and bought some warm shirts. At 5:30 we stopped and had a cappuccino and a latte at Baker Brun. The blonde waitresses here were very nice. We walked back to the hotel and at 7:00, I found a little niche in the hotel bar downstairs and worked on the computer, hoping the rain might let up before I ran. My prayers were not answered so I gave up and put on my rain running gear and umbrella and at 9:00 I ran in the pouring rain to the Brygge area but this time went on past the Håkonshallen and then up the hill. I finally reached a level area and discovered Sverresborg Fort which had old cannons lying about. You could see that this a good vantage point to shoot down on attackers. 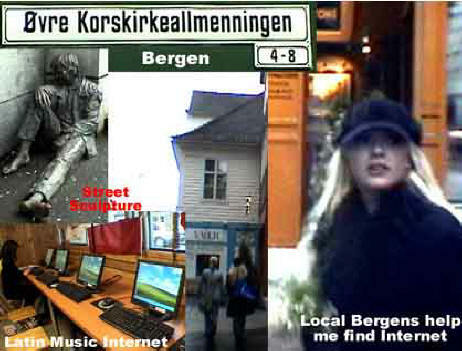 When I was done I looked for an internet café. Because the hotel was charging outrageous fees and the first place I went to was nice but a little stuffy with smokers, I kept looking around. There was a little store selling “Latina musica” and internet. The place had a lineup of beautiful modern fast computers and it was the cheapest of the lot. I sat down and did email and sent out Diario #6. I hurried back to the hotel and changed for dinner. 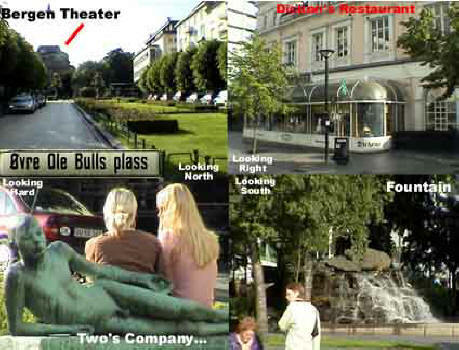 We walked only a block to Ole Bulls Plass [, +47-.] Ole Bull, born in Bergen in 1810, was one of the greatest violin virtuosos of his time and was considered a national hero by the Norwegians. The street named after him is very elegant with a large mount fountain at one end and the National Theater at the other. 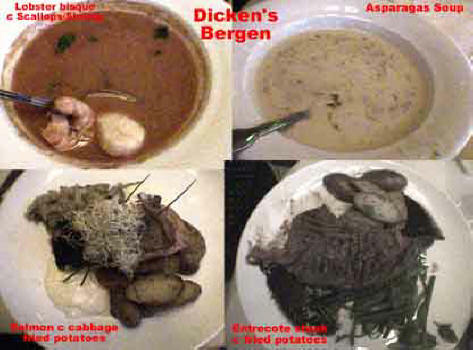 We reached Dickens’s Restaurant [Kong Olav V’s Plass 4, +47-5-536-3130] at 10:15 and luckily they were still serving. I had two diet cokes, lobster bisque with scallops and shrimp, salmon filet with cabbage and fried potatoes. It was all pretty good. Marcia had some red and white wine, asparagus soup and an entrecote steak with fried potatoes. We walked back to the hotel and I worked on the computer for awhile and got to bed at 4:30 AM. I woke up at 6:00 AM and again at 11:00 but finally got up at noon. I went down to the reception desk to ask the gal if she would help me get a room in Trondheim for our arrival there in two days. She called several places and got nowhere. She was told the problem was that there was a huge religious conference going on at that time and no hotels were available. This is the thing you dread when you travel like we do with nothing arranged in advance. Here we had the boat booked and no place to stay when we got off. I spent an hour on my cell phone calling the tourist bureaus in Trondheim and finally found the very last room available in a little hotel outside of town. This was very scary, but; crisis over. Relaxed, I went out in the rain to the major shopping center (right) across the plaza. This place is quite spectacular with all modern furnishings. 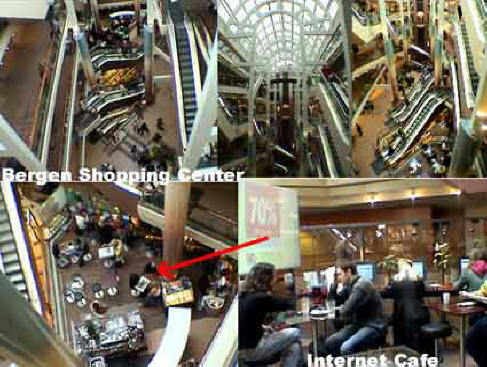 I checked out the great internet café there but they were more expensive then my place. I went into the Norli bookstore at 1:15 and used the camcorder to take some photos of the maps from atlases. After walking around for awhile, I started going into shoe stores looking for a pair of rubbers (left.) First they had no idea what I was talking about. Then I had to assure them I was not looking for condoms, but just a pair of rubbers to cover my shoes in the rain. After getting blank stares in 7 stores, I gave up. 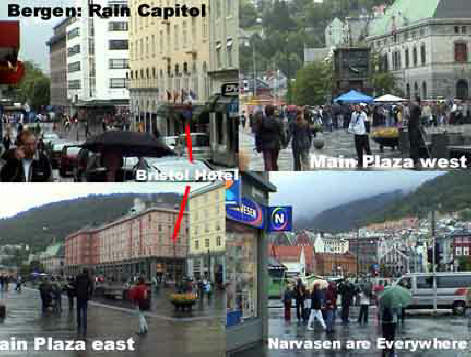 I asked this one gal, what the people of Bergen do in the rain and she told me they just get their shoes wet. I think there is a business to be built here since it rains 247 days out of the year. 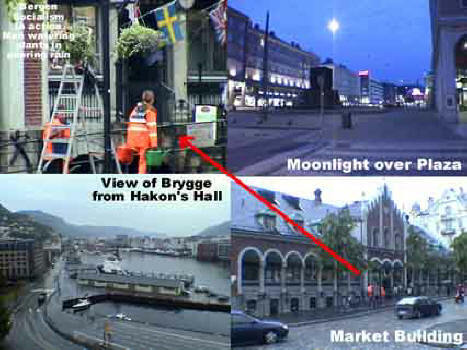 I walked down the street toward the Brygge and in one shop I bought warm rain jacket with a hood. This thing really did the trick. It was now 2:00 and I wanted to do a little touring so I went over to Mariakirke (St. Mary’s Church). 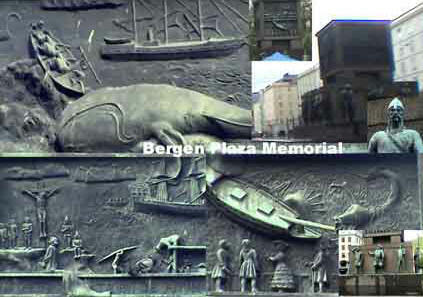 It was built in the 11th Century around the time Bergen was granted city status by King Olav Kyrre. 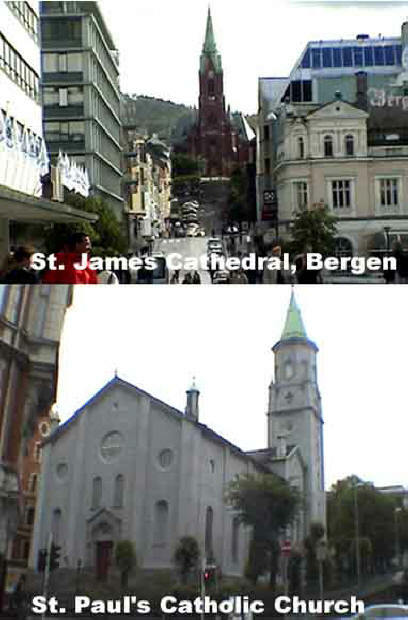 It is thus the cities oldest surviving church. 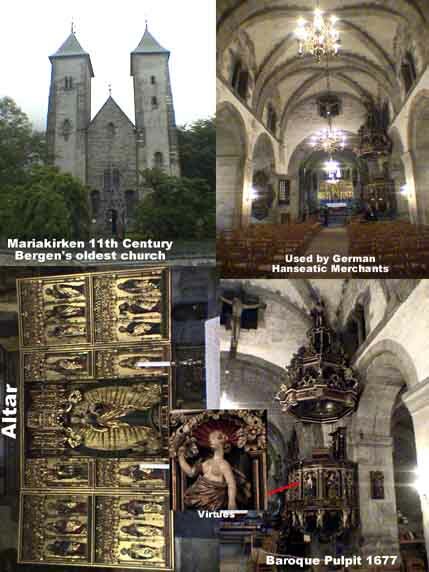 The Hanseatic German merchants used it as their church and really spent some money on it. The splendid Baroque pulpit was put in in 1677 and is decorated with depictions of the various virtues (with little clothes on). As I wandered around outside, I discovered the Schøtsuene so I went ahead inside. 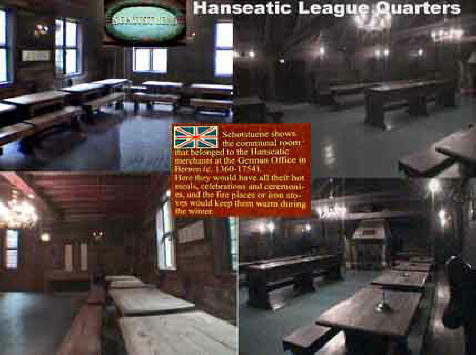 This was an example of the meeting rooms of the Hanseatic League with its desks and dining tables. 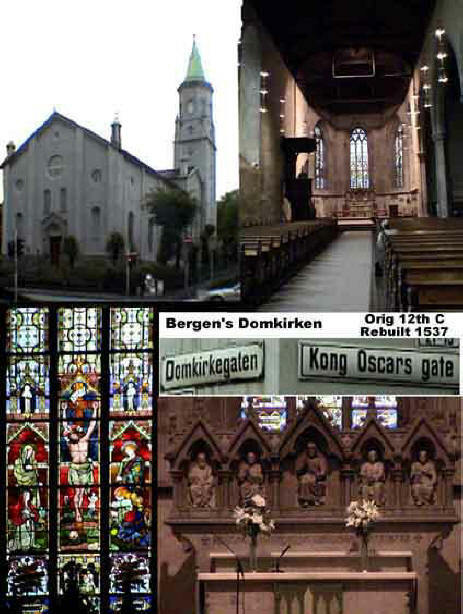 At 3:00 I wandered over to the Domkirke, Bergen’s main cathedral and took a look inside (below left.) Tired of touring at 3:30 I went back to my email place and sent out Diarios #7 and 8 and did my email. At 4:30 I went for a cappuccino at Mr. Bean Coffee, sitting next to some very pretty Norwegian girls. I then went back to the hotel and at 6:00 I went for my run around Lake Lille Lungegårdsvann to the large shopping center on the other side of the city. This time it wasn’t raining anymore. At 6:45 we checked out of the hotel, loaded the car and drove to the wharf to check in an hour early for the Hurtigruten Ferry.